Not quite the homemade taste but much better than the bottled stuff that masquerades as chutney. 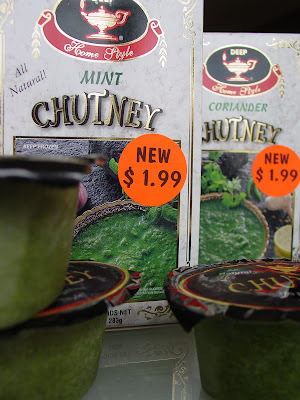 I found Mint Chutney and Coriander Chutney from Deep in my Indian grocer's frozen section. There are four containers, each about half cup, in each carton adding to the convenience factor. I preferred the mint chutney as it was tangier. The spice level is mild with the mint being slightly more spicy. I am not a fan of packaged ready-to-eat Indian food, frozen or otherwise, but this is something I plan to stock in my freezer. It won't stop me from making my own chutneys but these are a huge time saver! Update May 31, 2007: I found coconut chutney and concentrate for pani puris. The coconut chutney is reasonably OK. I haven't tried the pani concentrate yet. 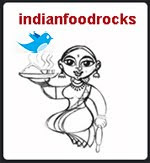 New On The Block: Yet another well-written Indian food blog, Evolving Tastes, with beautiful pictures. I've learned a lot from her in the past and I am looking forward to being regaled some more! Especially when it comes to Maharashtrian food. If her twist on the revered sabudana khichadi is anything to go by, I know I am only going to be enthralled!! Good finds, all of them: especially the blog :). I loved reading the sabudana khichdi post :). manisha, that nasty nirav mint chutney is the bottle (with the funky kala namak smell) can be salvaged by grinding it up with a bunch of coriander. then it's quite good. Gini, traditionally chutney is part of every meal. Salt, piece of limboo, chutney and pickle are always served first and on one side of the thali - Anita knows which side. I think it is the left side. My Mom always had a green chutney in the fridge and a dry red chutney in the pantry. I therefore find it hard to not have a stock of chutney! I use it as a spread: chutney on toast is one of my favorite snacks as well as breakfast. I use it on cucumber-tomato or tomato-egg sandwiches. When I make dudhi parathas or aloo-parathas, we eat it with chutney and yogurt. When I make my own chutney and there isn't enough to have with parathas or on sandwiches, I finish it off by adding it to my meat curries. I generally don't use ground coriander otherwise. I prefer chopped coriander. You must try the Hyderabadi Marag if you like the flavor of cilantro. Musical, the chutneys save time and don't have any of that strange smelling stuff they add to bottled chutneys. ET's blog is sure to be a delight! She's an excellent cook! Bee, that's a great tip for someone who gets suckered into buying those bottles. I threw mine out as soon as I opened it and smelled it. I would rather do without than have that bottled stuff again. Besides, if I have dhania-patti and I am pulling my blender out, I might as well make my own chutney. Those oranges(with lime juice) that I'm pickling with your lemon recipe are coming out FANTASTIC btw...i look forward to my daily turning so i can lick the spoon! Paratha with coriander chutney sounds really good and now you have made me really hungry. Will give the marag one more try. Pel, I do that quite often. I freeze it in ice-trays and once frozen, I store the chutney cubes in freezer bags. When I know I am going to do that I add more green chillies and more ginger than I normally would as I find that it loses some flavor on freezing. Right now I have a whole bunch of green chilli and ginger paste frozen as ice-cubes. It's very convenient. I guess cilantro is flourishing! My Indian grocer gets his from Miami and I have a fresh lot, too! Gini, I am sorry marag didn't work out for you. :-( It's the only recipe I think of when I buy lamb! I have a leg of lamb I bought yesterday and three lovely bunches of cilantro. So no prizes for guessing what I am going to be cooking soon! Try Nabeela's original recipe, made in the pressure cooker, and see if that works for you. My my, what an endorsement, Manisha. Thank you very much. musical, thanks for your compliments. I have been eyeing some recipes from your blog too. If you get the fresh Pudina, try making the chutney with anardana, pudina leaves, lil' lime juice and a bit of chopped red onions.....very typically Punju :). Some even add a bit of sugar and mirchi. I have recently developed this habit of freezing chutneys after a large scale preparation! Call me lazy, but it works for me.....thankfully coz' i get fresh mint and cilantro in the grocery store across the road. Though seriously i wish the local desi store here would stock more Deep products-some of them are really good. haven't tried the Nirav brand chutney that Bee mentioned.....i'll have to look carefully though. Hey Manisha, now i know you won't call me lazy for freezing chutneys :).....just read your reply to Pel's comment. Truly heartening dear :). and i freeze them as cubes too.....even coconut chutney!! Yayyy!! Finally I can leave a comment here. Now let me go read what she wrote. Manisha, since you have given it a seal of approval I might venture and buy some of the ready made chutney from Deep. I did not have a good experience the first time I bought them. Anyway be ready for the rotten eggs/tomatoes that may come your way if they don't taste good. that sounds like I bought Deep before, have tried other brands but not Deep. I tried freezing chutney once - it made my freezer trays turn all green! I should get green trays for this! But I just freeze, chopped dhaniya, whole green chillies, and ginger as is. For use, one has to remember not thaw dhaniya and green chillies at all, and only thaw the ginger for a few minuted and grate. Voila, fresh grated ginger. Actually, since my green grocer is just a 5 min walk :-)(less, if I buy from the raehdiwala), I freeze for emergency purposes only - when I run out of these essentials! There are usually some tomatoes also in my freezer. good find, will try the chutney. I also like the tamarind-date chutney (deep) and liven it up by adding fresh roasted & ground jeera pwd, it tastes so good. Actually, Pel, that chappie on the bike sells only coriander, mint, lemons and ginger. I was bragging about the cart-puller who stocks fresh vegetables and stands at the street corner. EvolvingTastes, welcome once again! Every word I said is true! Musical, I am ready for last week to end but now this week has taken over. I have never made chutney with onions so this is one I am going to make very soon!! Well, I still make and prefer my own chutneys but Deep is a great quick fix. I'd stay away from that bottled stuff. I think it's quite awful. Mythili, where have you been?! Your photo blog is simply beautiful. Send some of those flowers over to the Flower Fest, please! ISG, I have a strong protection against virtual rotten eggs; it's called a very thick hide. When it comes to tomatoes, please render them to the specifications of one of these recipes and I will gladly accept all incoming tomatoes. :D Let me say it again though, I think these chutneys were great for pre-packaged frozen stuff. I will still make my own chutneys, given the time and ingredients. Green, Anita?! I freeze them in beige plastic trays that I have had for 7 years now and that the previous owner of my old house had for at least 10 years before that! No green discoloring. For that matter, Medha has frozen that awful thing called Kool-Aid in them, too and it hasn't stained them. I tried freezing fresh dhania-patti and mint once. I read that you should put it in an ice -cube tray and then cover it with water. And then use the ice-cube. But it just looked so pathetic after the ice melted in the pan, that I never did it again. I do without or I pay exorbitant rates (almost $1) for a measly bunch. Out here, folks freeze whole ginger as well as grated ginger. I use so much ginger that I don't much care for the lessened flavor once it has been frozen. I pay anywhere from $0.99/lb (Indian and Asian stores) to $3.99/lb (usually at the regular supermarkets). The latter hurts but it's the price I pay for being picky about my ginger. Richa, I have eyed a tamarind-date chutney - not sure which brand it is - but since it's in a bottle, I haven't bought it. Also, since I usually have both tamarind and dates, I make my own. Worth trying you think? Pel, that's my trick now to get people to leave sooner than they want to. I put the salt out and hide the sugar. ;-) Things have been quiet this year but last year I had visitors for at least a week each in 7 months of the year. Some were back to back. :-@ This summer, I am thinking of returning the favor. All the more reason to get a nice pot, fill it with good soil,and get a few sprigs of your favourite mint, use the leaves in this chutney , plant the stems, and watch it grow! I use it in bhel, sev puri and the like. As I said earlier, once you liven it up a bit, it is pretty good. Speaking of frozen foods deep lilva kachori and palak paneer samosa is a hit with my family & friends. You can give it a try, if not already done so. oh, forgot to add, I bake the stuff, no need to deep fry, it comes out pretty good. That third world thing...you know...some things are lost and some things are gained...I'm going to keep it at that, because I could go on in fine detail...and this might not be the place or time. Manisha, I find the produce is cheaper and often better quality in the smaller "Asian" markets as well...plus I'd rather patronize a small business vs. a corporation... I was reading somewhere in some culture that to signal an obvious "departure hint" (that's my term, check with my lawyer for public use) a cold roast or cold something is served. It just came to me. No need for jumping-jacks. But it's a royal pain - inserting links in the comments - I don't know how this girl does it every time she leaves a comment (sometimes she inserts 3 or more links - :eye roll: ) :-) We don't call her TLO for nothing! Anita, that walnut-mint-dahi chatin sounds delicious. Haven't made it yet. This weekend probably. I am going to try to make it to the Farmer's Market and I think I'll pick up a mint sapling if there are any. Mythili, I am so glad you sent in your entry to the Flower Fest. My computer is finally stable and I am able to access all my drives so my entry is late but I will get it in. Richa, I've had baked kachoris at a friend's place. They were decent. Better than them being fried! Pel, just put the salt out instead of sugar and watch them disappear! ;-> But you know even though it was exhausting, I really enjoyed the time spent with all our visitors. Until they all showed up, I didn't know that we knew SO many people!! Arrey, you don't need a sapling. Just find the best tasting mint, and pot the stout stems, using the leaves for the chutney. That's how I grew mine! Manisha---I went for a walk this morning; After I dropped off the little bunny to a handsome wildlife expert I decided to take the camera and go see if the skunk cabbages were blooming in a one of the county parks...it didn't seem like exercise at all, not when the scenery is good. Exercise AND posting material... thanks for the inspiration! you should try lamxi brand chutney; it is in a bottle but taste quite good. Also,have you heard of Maaza? That is a great drink for the summer! Didn't make it to the Farmers Market cos of a sick child who had to be brought home early from a slumber party. Yes, many plans had to be quickly doused ;-) So your blog will be Flickring soon, Anita? Amrapali, which chutney did you like? I have tried a couple of their chutneys and was very disappointed. Some of their pickles are very good, though. Maaza? Oh yes. My husband brought home 2doz bottle of Lychee Juice recently. We also used to get their mango juice. Since moving to Colorado though, we drink more water. :-D And, welcome to IFR! I have a feeling we might even go to the same Indian grocer - the one on South Boulder Rd - Krishna Groceries? Is that where you found these super handy chutneys? I hope to return to blogging soon! Roopa, great to hear from you again! You are so right about CO weather and that is what I love about it. Ice over Easter, snow thereafter, cold and then take today: a glorious summer day! And yes, I found these chutneys at Krishna Groceries.I thought you were further up in Fort Collins for some reason. I'll catch up with you again soon! I am heading out for a long bike ride now!